Having previously taken a rifle class from Erik Lund, I welcomed the opportunity to take his Performance Shotgun course. Erik was assisted in this class by Tod Lit. The 590A1 in question has been upgraded to a Magpul forend, a Dave’s Metal Works aluminum follower and a Big Dot sight. From previous experience, I have found that the Bog Dot sight works really well for buckshot, but slugs at 50 yards start to become a challenge as the sight covers up so much of the target. This class was not a basic or introductory class in that we didn’t spend time on basic loading and unloading drills or rudimentary discussions on shotgun ammo. Erik did take a few moments to dispel a couple of shotgun myths. One of these was the oft repeated notion that the sound of a pump shotgun action being worked was enough to win an encounter. Another was the myth that a pump shotgun was more reliable than a semi-auto shotgun. While this may be mechanically true, it is not true of shooter induced malfunctions. As for technique, Erik is a proponent of consistency across platforms. As such, his stances for pistol, carbine, and shotgun are all similar. He stresses being balanced and having your hips oriented towards the target. After the introductions and safety briefings, we jumped right into the shooting. We began with a patterning drill. Erik described shotguns as “every shotgun is a snowflake” stressing that even across the same lines of ammo and firearms that they will perform differently in each shotgun. This was proved correct during the patterning drill. As for buckshot, the clear winner for tightest pattern was the Federal Flight Control 00 buckshot. From there, we did a few basic manipulation drills making sure that everyone was up to speed with the operation of their particular shotgun, and then we moved to reloading drills; a lot of reloading drills. Both strong and support hand drills were taught. After we worked through all of theses different drills, Erik told us to pick the one we preferred and to use it for the remainder of the class. We worked predominantly from a sidesaddle. Most of my previous shotgun work has been done using a belt mounted ammo carrier. While I prefer loading from a belt mounted carrier, I do believe that working from a sidesaddle makes more sense as the ammo goes wherever the gun goes. It is a much simpler equation to simply grab the shotgun and go than it does to take the extra steps of affixing belt carriers. Personal note: I strongly suggest using a sidesaddle that attaches by means other than the action pins. These are often installed incorrectly, usually due to over or under tightening of the pins, causing malfunctions. I’ve also heard of the additional stress on the pins leading to their breaking. I once had an issue to where the action wouldn’t lock, but everything looked fine. As to reloading techniques, we predominantly focused on those that would be used by the typical armed citizen or peace officer, but we did get to play around with a few of the competition oriented techniques, and Erik and Todd worked individually with any of the three gunners who wanted to work specifically on those techniques. After the extensive reloading work, we shot slugs at 25 and 50 yards and practiced slug integration (slug exchange, select slug, etc) techniques as well as handgun transitions. A note on the Big Dot sight is that using the top curving edge of the sight at distance makes getting hits at distance a more reliable prospect. We wrapped up with a few fun-and-gun drills. As for the 590A1, all in all it performed well. I experienced no mechanical malfunctions. The difference in the location of controls did get me a couple of times. The guy shooting next to me commented on one such occasion, “It looked like you got into your truck but somebody had moved the seat.” As the day went on, it did begin to become less awkward. It never quite got to the point where it pointed as naturally for me as does an 870. A couple of things that I prefer about the 590 are the lack of a loading gate and the fact that the ejector can be replaced with a screwdriver rather than returning the firearm to the factory. I will also grudgingly admit that location of the safety switch has some advantages. If an identically equipped 870 and 590A1 were next to each other on a rack, and I had to grab one and go, I’d probably grab the 870, but after this class, I would feel comfortable picking up the 590A1. We then moved on to the live fire portion of the class and did some basic shooting and assessment drills so that he could see where we all were as shooters. The drills were pass/fail drills shot against a standard. We shot these as a mix of individual competition and the entire class shooting the drills altogether. We also shot some pivot/turn drills as well as some reloading drills. After a supper break, we had a low light session. Sunday was a full day of shooting. The focus was primarily on shooting while moving. Added to that was some strong-hand-only and support-hand-only work. As for what he was packing, Mr. Hackathorn was toting a Hackathorn Signature Series 1911 from Wilson Combat. There was quite a bit of friendly banter back and forth on this issue as he is an unabashed fan of the 1911 platform. I enjoyed the opportunity to spend a couple of days with someone as venerated as Ken Hackathorn. I particularly enjoyed the back and forth banter and all of the historical insights. Before I get to that, I would like to thank the folks Rangemaster for organizing and hosting this conference. The chance to partake of that much collective knowledge was a wonderful learning opportunity. There were times when it was difficult to choose which class to attend as the concurrent options were all equally appealing. I took 24 pages worth of notes, and many of the takeaways from the sessions will be incorporated into our training program. William Aprill’s presentation concerning how violent criminal actors (VCAs) select victims forms the cornerstone for this area of discussion. It basically comes down to the VCA making a “go or no go” decision based on indicators by the person they have targeted. This is really no different than a lion surveying a herd of lion food and picking which member of the herd will be dinner that night. Shane Gosa, a fellow Georgia peace officer, presented “The Mental Trigger” based on Jeff Cooper’s Principles of Personal Defense as well as other pertinent information. Shane also addressed items such as mental awareness and winning the violent encounter rather than merely surviving it. Tom Givens’ presentation on “Defining the Threat” was outstandingly well done. Mr. Givens approached the question from the perspective of a citizen and not that of those in the military or uniformed patrol officers, and his breakdown if the information is the best I have ever seen. His presentation (as was Chuck Haggard’s) on active shooters was nicely done, and quite frankly, I don’t understand how anyone could receive that information and then go about without the means to defend themselves. As for active shooters, or active murderers as they should be called, every examination of the topic that have seen shows that the more rapidly force is brought to bear on the murderer the lower the body count. Jim Higginbotham’s “Fire for Effect” presentation focused on accuracy in a critical event. I found his illustrations of how many of the qualifying and competition targets actually reward high point values to areas that are not likely to instantly incapacitate a violent attacker to be quite revealing. In my words, a fellow can kill you a whole lot if you give him 15 seconds to do it. John Hearne did an outstanding job of debunking many of the myths and outright falsehoods that permeate firearms training. I’m not much of a “science guy”, but his explanation of how the brain works was done in an easy to understand manner, and he makes a strong case for training to the point of “overlearning” (fancy scientific term) and building the proper mental maps and skill level as predictors for success in a violent encounter. At this point, I would like the readers to take note that there is some commonality when both peace officers and private citizens are faced with a violent encounter, and overcoming the “initiative deficit” is imperative. The difference here is that peace officers often initiate contact with the VCA whereas the private citizen is targeted; however, it is the response to that violence that must come swiftly and decisively, and the preparation shouldn’t begin at the point a person realizes there is a need for such. Posted in Class Review, Training & Shooting, Uncategorized on February 27, 2014 by J. Lee Weems. The high point of the class, in my opinion, was a block of instruction taught by Frank Proctor. Mr. Proctor is a member of the Unites States Army Special Forces, and he is also a USPSA Grand Master as well as being an IDPA Master. His block was concerned with weapons manipulations and focussed on “processing” what was happening throughout the shooting process. I look forward to being able to take more classes from him in the future. Tiger McKee also taught a block of instruction on weapons manipulations. I picked up several teaching points from him that I will be incorporating into future classes. Of the academic blocks, I found a block on Critical Incident Amnesia to be very informative. Of note, this material applies not only to officer involved shootings to both victims of violent crimes and citizens who find themselves in situations in which they must use force. This block is one that will go well beyond the range as it will also come into play when conducting interviews. There were blocks on many other shooting and academic areas such as law enforcement officers flying while armed, lesson plan development, and ballistics. As for the overall course itself, in comparison to the Firearms Instructor course at the Georgia Public Safety Training Center, the GPSTC course involved much more teaching of the prospective instructor on how to teach the art of shooting. The FBI course had more of a focus on developing the instructor’s overall firearms knowledge. The GPSTC course was also centered around the pistol with the shotgun being the only other platform utilized in that course whereas the FBI course covered pistol, rifle, shotgun, and, yes, the revolver. Another area of comparison is that the GPSTC course is taught completely by academy staff, and the program is the same regardless of staff instructor teaching it. The FBI course utilized many area instructors, and it appeared the subject matter could change significantly depending upon the instructors that teach in a particular class. Also, as this particular class was held in Alabama, there was a strong tendency towards the Alabama POST (APOST) standards, which fairly closely mirrored those of the FBI itself. The APOST courses have much more of a focus on longer range accuracy (50 yard shots with the support hand on the revolver course), and they are typically shot on one target. The GA POST standards which have more draws and reloads under time and require shots on multiple targets as well as shots while moving. Finally, the biggest lesson I took from the course was from a major mistake that I made. Throughout the course, we had a running “Top Gun” competition going. I won several of the individual courses of fire and was very much in the running for the award. The last course that we shot for score in the competition was the rifle course, and here is where I made my error. The last time that I had my rifle out was during a manhunt at night. I flipped the rear aperture to the “low light” aperture. For those unfamiliar, this aperture is much larger to allow the shooter to get more visible light around the all important front sight. It is also often used in “close quarters” situations as it allows for faster sight acquisition. The trade off is that it is much less precise than the smaller aperture. Ultimately, I stored my rifle without flipping back to the smaller aperture and thus I shot the entire rifle course with the wrong aperture and gave up enough points that I finished in third place. The top three places were decided by points to the right of the decimal place. I do have the satisfaction of being beaten with my own gun as I loaned a revolver to the eventual Top Gun winner after the revolver his agency provided him would not function properly. He is also a member of the U.S. Army Special Forces. I feel pretty good about running down to the wire with one of the elite. Recently, I sent out a flier for a Lever Action Patrol Rifle course that I am teaching in March of 2013. I received a response from an officer who was appalled that I would teach such a course. In fact, he stated that in doing so, officers might actually take it as an endorsement from me that the lever action platform was worthy of use as a patrol rifle. My response: I am endorsing the lever action platform as being worthy of use as a patrol rifle. The lever action platform has been a viable personal defense platform since it came onto the scene in 1860 in the form of the Henry Rifle, and the Henry was itself a reworking for the Volcanic Repeating Rifle. Confederate soldiers facing the Henry Rifle in battle called it “that damned Yankee rifle that you load on Sunday and shoot all week”. Note: The above is not a slight to the Spencer Rifle and others of the same era, rather it is in homage to the direct lineage of the platform as we know it today. The trend towards the use of patrol rifles was jump started by the North Hollywood Bank Robbery in which two gunmen clad in body armor engaged officers from the Los Angeles Police Department in gunfight lasting for over 40 minutes. The LAPD officers were armed with pistols and shotguns, and their rounds could not penetrate the body armor worn by the bandits. Eventually, officers went to a nearby gun shop where the owner provided AR 15 rifles, and LAPD SWAT officers arrived on scene and ended the battle. I doubt that any of those officers on scene that day would have turned away a Marlin 336 as being unworthy. I am not making an argument that more modern options such as the AR platform be completely abandoned in favor of the levergun. I am simply making an argument that the lever action rifle remains an effective option for use as a patrol or personal protection rifle. In fact, there are some areas in which I believe the levergun offers some advantages. The biggest advantage that a lever action rifle offers in the firearms market at the time of the writing of this article is availability. The talk of gun control legislation has resulted in a shortage of AR platform and other similar rifles. In the past few weeks I have ventured to out to as many shops I could get to, and the only AR platform rifles I could find still in stock were all class III rifles requiring extensive paperwork and an approval process that is measured in months. However, in several shops I have been able to find leverguns readily available for prices as low as $250. To go along with this from both an individual peace officer and agency administrator standpoint, the price point makes a fine old levergun an attractive option to perform this function. That trusty deer rifle can do double duty, and an agency that might not be able to afford outfitting all of its personnel with AR platform rifles could more readily purchase leverguns. Another advantage of the traditional levergun is that it fires heavier bullets than most of the modern semi-auto platforms commonly used as patrol rifles. So as not to overly-bore those readers who for some reason don’t spend their free time studying ballistic performance, what this translates to is that the rounds typically pack more punch and more readily penetrate barriers. This factor comes into play in such instances when a peace officer might have to shoot through a vehicle body or windshield to end a violent confrontation. I have personally witnessed standard .223 ammo (standard AR platform ammo) disintegrate when going through such barriers, but considering a standard .30-30 rifle will be hurling a projectile three times the weight of a standard .223 round this issue is substantially alleviated. While on the subject of ammunition, I would be remiss if I did not point out that leverguns are also available in several popular pistol calibers such as .357 Magnum and .44 Magnum. While such rounds do not have the range of a rifle round, common loads in each can achieve notable penetration, and considering the elements and range predominant in the proverbial “average gunfight” the effective range such firearms is up to the task. One should also not discount the inherent reliability of the lever action platform. One need not worry about gas systems or magazines. Simply work the lever and keep going whilst shoving rounds into the tube or action as needed. Nothing in the above should be taken as an argument for the wholesale adopting of leverguns in place of other platforms. Also, I most certainly am not making an argument concerning what one needs other than that I steadfastly believe that each and every peace officer should go on duty with a rifle at hand. This is about expanding capability, and a rifle is more efficient at ending a violent encounter than is a pistol. ***Note: The above was written with a law enforcement audience in mind. I also wholeheartedly endorse and advocate the use of the lever action platform as a personal defense rifle. This endorsement is not to be construed as an argument that citizens should be unconstitutionally restricted from owning self-loading rifles or unconstitutionally restricted in the ammunition capacity of their rifles. Recently, I had the opportunity to complete the International Association of Law Enforcement Firearms Instructors (IALEFI) Master Instructor Development Program. 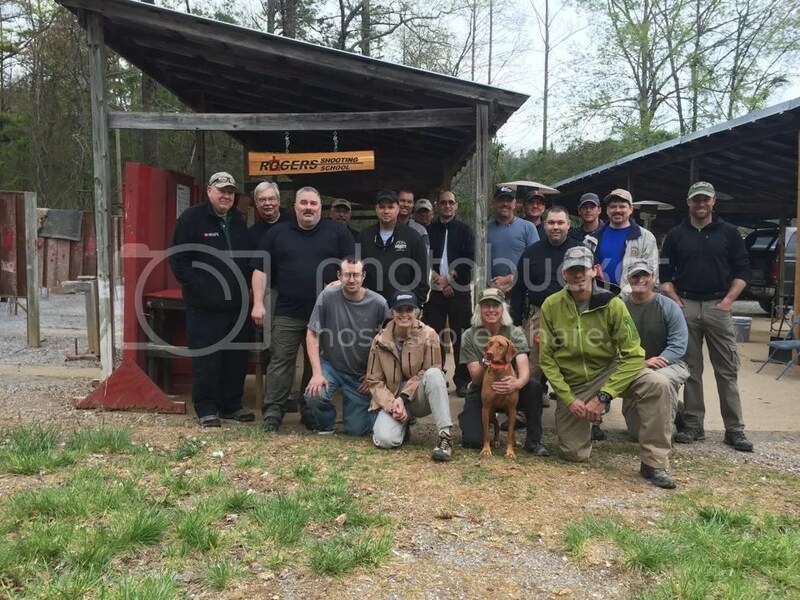 This course was sponsored by the Georgia Association of Law Enforcement Firearms Instructors (GALEFI) and was held at the Clatyon County Police Department range. All participants in the class are currently firearms instructors, and true to IALEFI being an international organization, there were a several participants who teach outside of the continental United States. The program is a 24 hour workshop with eight hours devoted to pistol, rifle, and shotgun respectively, and the rifle and shotgun portions included some transition to handgun drills. Most of the drills were conducted on a par time standard, and there were quite a few drills run on a competitive basis. One of the participants in the course was Erik Lund, a USPSA Grand Master (top five percent of shooters in USPSA). Erik was a good sport in the face of friendly but merciless harassment for the duration of the course. Erik was also nice enough to let an out of shape Chief Deputy type sneak up and beat him on a drill (sorry Erik, you know I had to include that 🙂 ). The drill is called “The Crucible”. It consists of a pistol loaded with two rounds with a reload magazine with four rounds. At the start signal, the shooter draws and engages the IALEFI-Q target with two rounds to the head, performs an emergency reload followed by four shots to the body all from a distance of five yards. Erik’s time was a 4.92, and mine was a 4.87 for a whopping .05 second win. He turned it up after that, and I didn’t beat him again, but I do now claim the title of “the guy that shot next to Erik Lund”. This was the first drill that we shot on the pistol day. We shot it again at the end of the day. He got his score down in the 3.3 seconds range. My time on the second run was a 3.89 seconds, but one of my shots was an eighth of inch outside of the circle for the head shots. While we did some accuracy work, most of the pistol drills were focused on speed based on the adage that most law enforcement shootings consist of three to five rounds fired at three to five feet in a time frame of three to five seconds. Some of these drills consisted of one shot and two shot draws at five yards on the clock. The par time standard for a one shot draw was 1.25 seconds, with my time being .89 seconds, and the par time for a two shot draw was 1.75 seconds with my time being a 1.14 seconds. Other drills consisted of shooting on the move and one handed shooting. In the rifle portion of the class, we began by checking to make sure our rifles were zeroed properly. We then worked through a series of drills involving one-handed manipulation, multiple targets, grounded weapon, support side shooting, and shooting on the move. We did weapon transition drills in which dummy rounds were randomly loaded into our magazines. As we proceeded through the drills, anytime we got a failure to fire due to our rifle feeding a dummy round, we transitioned to our pistols to complete that drill. For decades, the shotgun was the prevalent shoulder weapon available to peace officers. Traditionally it consisted of a pump action shotgun with a cylinder bore barrel and buckshot and maybe slugs. In recent years, the patrol rifle has supplanted the shotgun, but the shotgun still has a place due to its versatility. In addition to buckshot and slugs, the shotgun is also capable of delivering a wide range of less-lethal munitions. Our drills with the shotgun also mostly revolved around speed, but we also concentrated on some one-handed manipulation and transition to handgun drills. One drill that we did on the clock involved five steel targets. We were loaded with four rounds in the magazine and had to put one shot on each target with the fifth round being a combat load. My time on this was 3.88 seconds shooting a Remington 870P. This was topped buy another participant who was also shooting an 870P. He broke the 3.0 second barrier, and the aforementioned Erik Lund did it in 2.5 seconds shooting a Benelli semi-auto. We finished up with an extremely fun drill called Rolling Thunder. We formed teams of five shooters. Each shooter started with a loaded pistol and one round in their shotgun. On start signal, the first shooter fired their shotgun round, then it went down the line. After each shooter fired their shot, they combat loaded two rounds. When the fifth shooter fired, they gave a “clear” command and it started over with each shooter firing their two shotgun rounds. This continued all the way through the combat loading of five rounds, and on the final relay each shooter combat loaded one round and when their turn came they fired their shotgun round and transitioned to their pistol for one round. All in all this was a very good experience. Some of the material was dated, but the friendly competitiveness on the firing lane more than made up for it. The shooter that you were competing against one moment was legitimately trying to help you improve the next. The professional connections made were invaluable. I already have commitments from several of the other instructor for some training for the Sheriff’s Office, and I brought back quite a few ideas to improve our own in-house training.